Every summer, high temperatures and extreme heat waves take a toll on vehicles and their engines, which can lead to unexpected expenses for unprepared drivers. In fact, the American Automobile Association (AAA) estimates more than 8 million automobiles in need of their roadside assistance during the summer months. Since this figure is most to increase this year because lower gas prices are encouraging more summer road trips, Cottman Transmission and Total Auto Car released today a list of tips to help prevent cars from becoming a statistic. Check Coolant Levels: While the engine is running, a vehicle’s cooling system regulates the engine’s operating temperature. To keep the cooling system operating at peak efficiency, it is important to have the coolant level checked periodically and the coolant system flushed as recommended by the vehicle manufacturer. A car owner’s manual will have more information on the best schedule to follow for your vehicle. Inspect Radiator for Debris: While driving, dirt and road debris can build up on the radiator and cause a blockage in airflow and heat transfer. When this build up occurs, have your technician clean this system to prevent overheating. Inspect Tire Pressure: If a vehicle’s tires are worn or cracked, it can be risky driving in hot weather. There is a great chance the tires can blow out, which at high speeds can be extremely dangerous and cause a collision. Check Your Battery: Most car batteries last between four and five years. This figure greatly varies in hot climates, where car batteries usually last about three years. With that said, because high temperatures can damage a car’s battery, it is recommended to be especially cautious during the summer and have your battery tested. 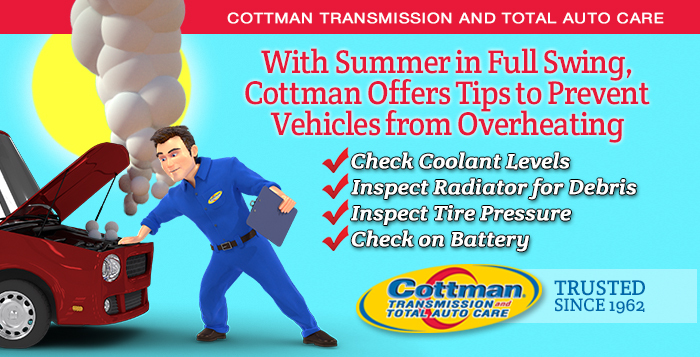 Another resource available to drivers interested in fuel efficiency is The Cottman Man’s Educational Video Series, which Cottman Transmission and Total Auto Care recently released as an informational resource for preventative and proactive car care tips. To view The Cottman Man Educational Video Series, visit https://cottman.com/videos/. To learn more about Cottman Transmission and Total Auto Care and its available franchise opportunities please visit https://cottman.com/cottman-franchise-opportunities/.